Rotterdam, The Netherlands – November 19, 2013 – LISTEQ, the global leader in easy and affordable Cloud Desktop and BYOD products, announced the launch of their latest product: Cloud Desktop. LISTEQ Cloud Desktop creates an online PC accessible from any device (http://www.listeq.com/products/cloud-desktop/), targeting worldwide all Service Providers. The product is completely based on LISTEQ technology. Desktops are virtualized in the Cloud with LISTEQ’s VDI technology BoXedVDI and come with a variety of access Clients for all commonly available platforms (Windows, Android, iOS, Linux and HTML5). 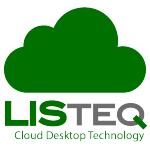 LISTEQ Cloud Desktop is the ultimate Virtual Desktop solution for Service Providers. The product can be delivered under Private label, providing Service Providers the means to fully target their own customer base with their own brand. End-user pricing is typically on a Pay-Per-Use model without any upfront costs. Windows licensing can be added optionally. “Our available technology provides all Service Providers with their own mobile solution and the means to easily extend their product portfolio in a very profitable way.” said Simon Overgaag, CEO of LISTEQ. Service Providers can request a free demo account via services@LISTEQ.com.